What's The Point Of The 2017 Chevy Colorado's New Engine And Gearbox? 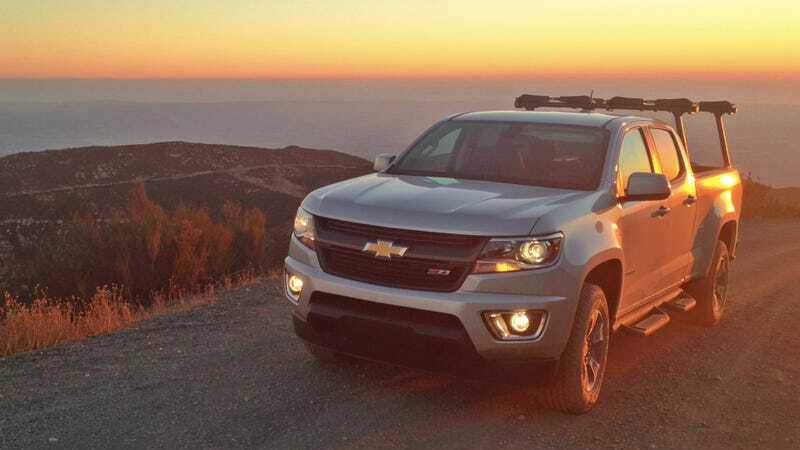 General Motors is giving the Chevrolet Colorado an entirely new V6 gasoline engine with cylinder deactivation and an eight-speed transmission for 2017. Apparently the idea is to give the truck better performance and economy, which sounds great. But GM’s estimated new 0-60 mph and MPG figures? “Essentially [a] carryover” from the old truck. Boo! Intriguing, but ambiguous. I don’t know about you, but I “notice” my car “pulls harder” after a fresh wash.
What’s new about the engine? The 2015 and 2016 Chevy Colorado’s V6 was a 3.6-liter, and so is the 2017's. But we’re told that’s pretty much where the similarities end. GM’s truck communications chief Monte Doran told me the new engine and the old one have “identical displacement and configuration, but share virtually no parts” in an e-mail. The new V6 is rated at 308 horsepower at 6,800 RPM and 275 lb-ft at 4,000 RPM. It’s a negligible increase over the previous engine’s 305 horsepower and 269 lb-ft ratings at the same engine speed. What’s new about the transmission? The new eight-speed gearbox is a Hydra-Matic 8L45, which GM says is “roughly the same size and weight as the 6L80 six-speed automatic it replaces” so the new truck’s curb weight and payload capacities should be the same as the current truck. The eight-speed has a numerically higher first gear ratio making the truck hustle harder off the line. A numerically lower rear axle ratio is supposed to improve fuel economy at cruising speeds. While the six-speed had a total ratio of 6.0, the eight-speed goes up to 7.0. That basically means the new transmission has a little more flexibility in picking the best gear for a given situation, helping the truck make the most of its engine output. That transmission will be the V6 engine’s standard pairing for both 2WD and 4WD trucks, the six-speed will be completely done away with. So what will drivers actually get out of this? The sensation he’s referring to would probably be explained by the higher first gear ratio. That could give the truck a greater feeling of “surge” when you step on the gas from a stop without really adding accelerative power over a significant distance. So 3 horsepower and 6 lb-ft of torque didn’t shave any time off the stopped-to-speed limit run, but I’ve got to believe the extra gears, lower rear ratio and cylinder deactivation will help fuel economy. But apparently not really. “We don’t have EPA numbers [for fuel economy] yet, but expect it to be essentially carryover,” Doran said. Now in fairness, it is possible that drivers will see “real-world” fuel economy gains even though the EPA doesn’t detect them in their testing cycle. I want to believe the Colorado will get better mileage with two extra gears. After all, eight-speed transmissions yielded a pretty big bump on GM’s big SUVs when they were upgraded two years ago. In case you’ve forgotten, the current V6 Colorado is EPA rated to 21 MPG in combined driving (and 18 city, 26 highway) with 2WD while the 4WD version gets 20 combined, 17 city, 24 highway. So what’s the point really? I’m still a little confused on that part. To recap: the 2017 Colorado V6 has an entirely new engine, with cylinder deactivation, and two more gears without adding weight to the transmission, for an expected gain of nothing on 0-60, nothing on economy, and nothing on hauling capacities. There’s got to be some kind of supplier, emissions, regulatory or reliability reasons why the truck’s heart is being changed. We don’t know how much the ’17 Colorado V6 will cost yet, but has to be more than today’s truck to pay for that R&D. I guess we’ll find out before the end of this year, when the new truck is supposed to hit dealerships. 2015 Chevy Colorado First Off-Road Test: Can It Sneak Into Mexico?